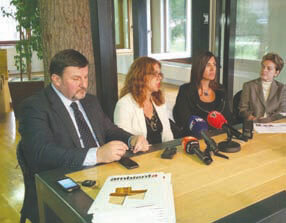 Press conference in Cakovec October 3rd 2014, Pana Ltd.
A conference was held on the occasion of the announcement of export results of wood processing sector and of the participation of domestic companies at the AMBIENTA fair. 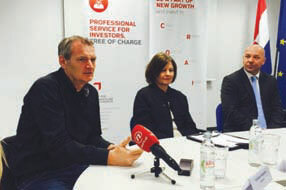 It was very well attended by the media accredited in the North-West Croatia. Export results of the wood processing sector in the first sixth months of 2014 were very positive, and the wood processing industry is almost the only one that has achieved double-digit growth. What is particularly emphasized is the growth in exports of furniture, flooring, windows, doors and other final wood products. The most notable result in the period January to April 2014 was achieved in exports to the German market, where furniture exports grew by as much as 35.8 percent! A conference was held to mark the improvement of the furniture production program, introducing new brands and attractive products. Croatian companies – furniture producers (Prostoria, Inkea) are winners of prestigious awards for design (Interior Innovation Award 2015) given by the German Association for Design (German Design Council). The awards were given at the world’s largest furniture fair IMM, which was held in January in Cologne, Germany, and where Croatian producers exhibitedvery actively.